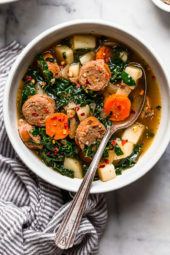 This soup will taste as good as the sausage you purchase, so be sure to find an Italian turkey or chicken sausage that you like. Spicy sausage or Cajun-style Andouille sausage would be great if you want a little more heat. 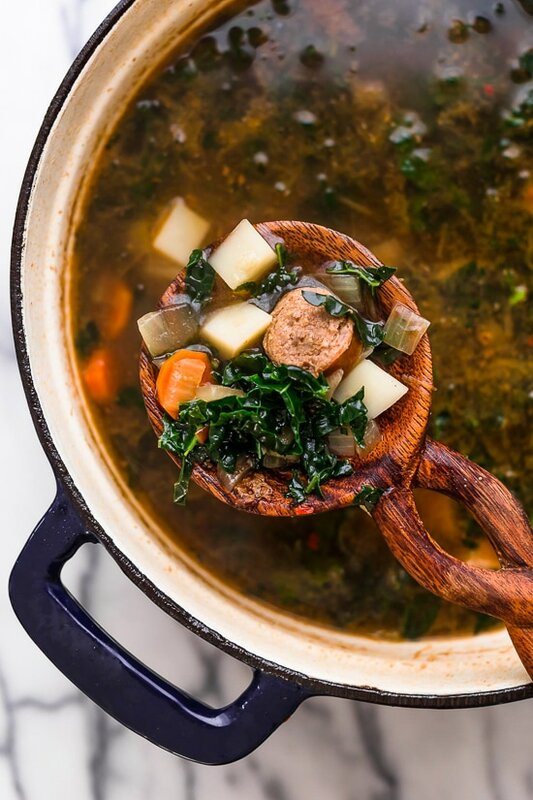 To make this vegetarian, you can swap the sausage for vegetarian sausage and vegetable broth. You can swap the potatoes for canned white beans. Try swapping the kale for escarole or Swiss chard. In a large Dutch oven or pot, cook sausage over medium-low heat until browned, about 10 minutes. Remove from pot, let cool and cut into thin slices. Add oil, onions and carrots; cook on medium until soft, about 5 minutes. Add garlic and cook 1 minute more. Add broth, water, black pepper, sausage, potatoes, red pepper flakes and bring to a boil. Cook, covered for about 10 to 15 minutes. Add kale and cook partially covered until the potatoes are tender, about 5-6 minutes. Adjust salt if needed. I wanted to make my daughter a vegan kale/potato soup and your recipe came up! I used veggie broth, and vegan sausage, and it was delicious! I will definitely adapt this recipe to her needs in the future! Very good. I added extra garlic and red pepper, only used 6 cups of broth along with salt while the kale was cooking. Would make this again. I am making this soup today. Looking forward to trying it. Everything I have made from ST site or your cookbooks has been amazing! Does the casing stay on the sausage or should it be removed? I’m seeing a lot of comments saying it lacked flavor and salt. I have to disagree and think you can adjust the salt to your liking. If you add some kind of grated parm or pecorino, pepper flake and a squeeze of lemon or splash of balsamic you can add more flavor without added salt. I think we are conditoned to the taste of heavily salted soups from cans that we forget what real food is supposed to taste like. I will definitely be making this again. This was delicious! My roommates complained that it was bland and missing salt, but for medical reasons, I can’t add much salt to my cooking. I told them to go ahead and add it to their own bowls though. Next time, I may add more red pepper and cut the sausage smaller. I used two cans of beans instead of the potatoes to lower the carbs, and it worked great. I wanted to like this because I love almost every Skinnytaste I’ve ever made but the soup was basically tasted like sausage water. I served it to my family but couldn’t eat it myself. I wont be making it again. Sorry you didn’t like it, perhaps the broth or sausage you used lacked flavor. Maybe the broth did. What brand do you use? That could definitely make all the difference! 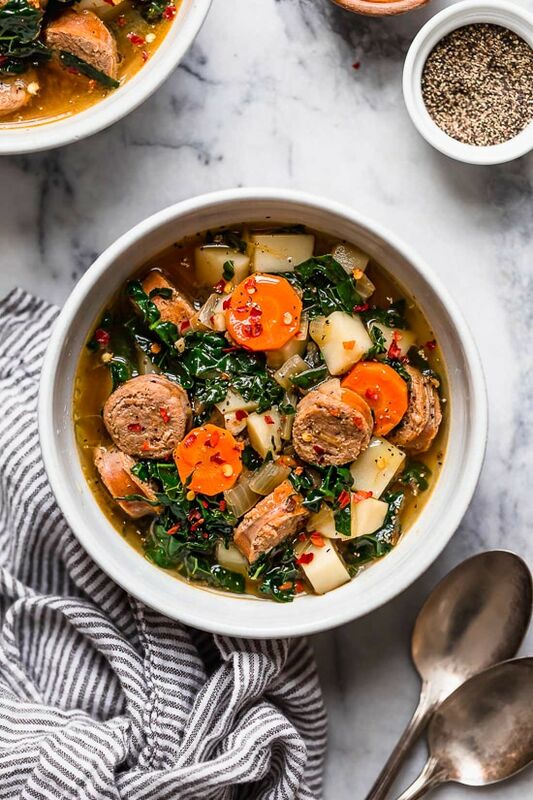 Such a delicious, healthy, hearty soup!! Eating this for lunch as I type this review because it came out just that good! Thanks for another great rotation item! Delicious! I used ground Italian turkey sausage and sweet potatoes. Definitely a winner! Great! I used chicken sausage instead of turkey and I also removed it before adding other ingredients (I do not eat meat but my husband does). After the soup was done, he added the meat to his soup. I also used frozen potatoes and kale! Just needed to adjust seasonings for our taste but it was great. Another winner. I actually bought no sodium chicken broth. How much salt should I add? I tend to have a problem adding too much or too little. My family has loved almost everything I’ve made from here. But, this soup was not our favorite. We choked it down and I threw the rest away. I followed the recipe exactly. It was lacking flavor and heartiness. I made this last night and it is delicious! Such a great lunch on a cold winter day. The smoked sausage gives the soup a great falvor. Thank you! I made the soup last night. Loved it! !!! Love this recipe. Easy and pretty quick. I used Aidell’s spicy mango chicken sausage and added fresh chopped parsley to the onion/garlic/carrot saute. Yum! How would I make this in an Instant Pot? In general, cut the cook time in half. This was awesome! I was ready to serve it and friends dropped by, so I added a can of cannelloni beans to stretch a bit and we still have leftovers and I shared with an elderly neighbor (I’m one, too) . Thank you, Gina. You have awesome healthy recipe developing abilities making foods that taste terrific.. I really love soup so much whether chicken, vegetable etc. It is a perfect start to a dinner especially in cool winters. I found this to be very bland even with good turkey hot italian sausage…what am I missing? I was thinking to cook a little bacon or onions just in the bacon grease would help. Any other ideas? What brand of broth are you using? Is it low sodium? Yes, it is low sodium. It was Swanson. To the soup while cooking: Add a T or 2 of pesto. Add a bay leaf. Add a parmesan cheese rind. Add an herb bouquet. No water, ONLY use the best stock you can find. Add more potatoes. I add all of this and use a whole bag of baby red and it’s still only 5 points a serving. Then for serving (depending on your points allowance): add a t if pesto, crumbled center cut bacon, and a T or 2 of grated ramano. I do all if these and this is one of the best soups I’ve had from this site! This is a great addition to my soup rotation. My husband LOVES potatoes, so this gives him the taste without feeling heavy. This soup ate very hearty to me for something that is so light. 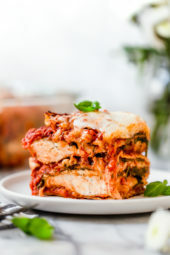 My whole family and friends I had over loved it and my friends asked for the recipe. I put extra red pepper flakes in mine and it had a great kick! This was AWESOME Gina! This was great! I used pre-cooked chicken chorizo sausage, Swiss chard, and small white beans instead of potatoes. I added some Italian seasoning, too. Looking forward to eating the left overs for lunch! 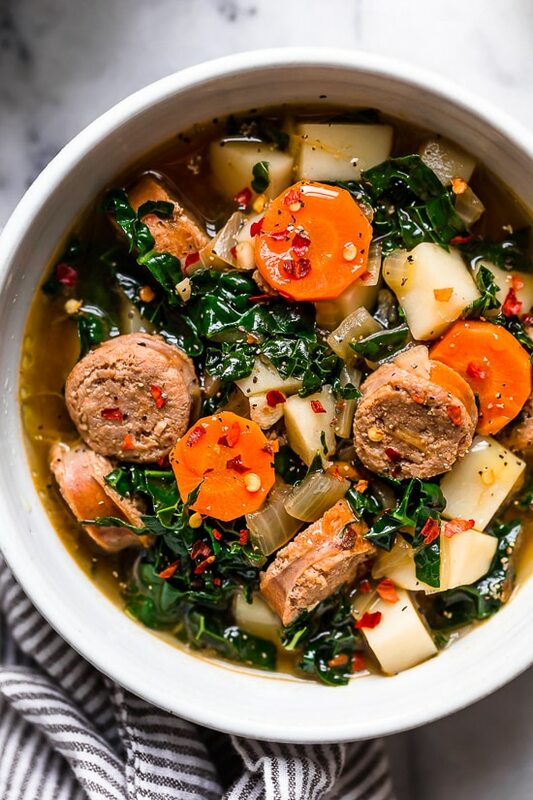 This is a great variation of Portugese caldo verde which I make often. We grow kale and it is perfect in the soup. The original recipe uses linguica but this is much healthier. Can I use spinach as opposed to kale? If so would I still use 8 cups and how different would the calories be? Sure, don’t know the nutrition facts off the top of my head. This soup is great, I subbed cauliflower for potatoes, but my Kale turned grey And unappetizing, I just bought a big bunch and chopped it, does it need to be balanced first? If substituting white beans for the potatoes, would it be 1 can or 2? Gini—how do I adjust for an instant pot. Thank you in advance. For the sausage, are you referring to pre cooked sausage? I cannot find raw italian chicken or turkey sausage at any of the stores I go to. I picked some up at Wal-Mart last night. jenny-o has the sweet Italian and spicy Italian raw sausage. I can usually find it at Ralph’s, Vons, Food 4 less and smart and final. 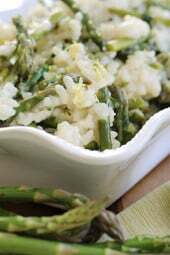 I just made mine in my instapot using the slow cooker function. I just sautéed the veggies and sausage first then added the rest of the ingredients. From the first time I made this, it has become our favorite winter soup, served along with jalapeno cornbread. Our preference is to make this with a Cajun-style Andouille sausage. 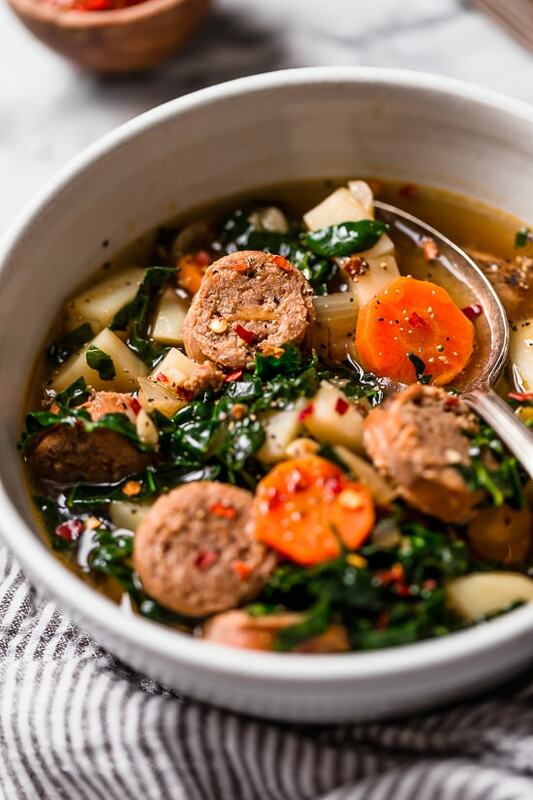 The spice from the sausage is perfect with the kale; I do not add the red pepper flakes since using a spicy sausage. We double up on the vegetables when we make; I also add 1 cup of chopped yellow bell pepper. 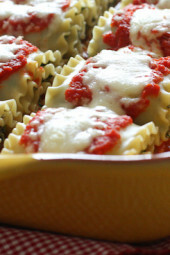 Delicious, hearty and satisfying! Can you use sweet potatoes instead? Delicious! Question: did you mean for it to be pre-cooked sausage? I bought fresh and ended up sautéing it longer after getting deeper into the recipe.